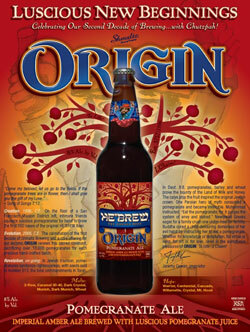 Shmaltz Brewing Co. begins its second decade by announcing it will release three new “radical” beers including, starting with ORIGIN: Pomegranate Ale (8% abv), an Imperial Amber brewed with pomegranate juice. Rejewvenator (Year of the Fig, 9% abv, Fall ‘07) and Jewbelation Eleven (11% abv, Winter ‘07) will follow. Shmaltz will also continue production of Bittersweet Lenny’s R.I.P.A. (a tribute beer to the late Jewish comedian Lenny Bruce, 10% alc.) throughout 2007. All four beers are available in 22-ounce bottles. – Magic Hat Brewing has announced a new program of “uncommon craft-brewed specialty beers created to take both brewing science and liquid alchemy to the next level.” First up in the Wonder Beer series will be an Imperial IPA, a medium-bodied golden-copper ale of “pure hop astonishment.” Wonder Beers will appear in very limited single batches approximately every two months.